Photo by Burcu Avsar, Prop Styling by Linden Elstran, and Food Styling by Hannah Kirshner. I wish that when I was in art school—painting prolifically and studying furiously, throwing elaborate dinner parties in friends homes because I didn't have a kitchen in my dorm—I knew about food styling. I longed for a career both culinary and visual, but couldn't imagine what that would look like. If only someone had told me about food styling! I could have spent a summer assisting in New York (sleeping on a friends couch and waiting tables to pay the bills). Instead, I taught myself food styling by accident, not even realizing that what I was doing had a name, was a skill, and could be a career. If the term food styling means anything to you at all, you might imagine someone pouring cereal into glue or making ice cream out of mashed potatoes for an advertisement. It’s true, that’s one way to go about things, but magazines and lifestyle brands trend toward naturalistic styling and using real food. A food stylist is a cook and an image-maker. She works with the photographer, and often a prop stylist too, to create a pleasing composition and to convey a mood, a narrative, or a concept—and of course to make the food look its best. Some things, like pizza and birthday cake, are best on the second day, eaten for breakfast. Here's my favorite way to enjoy that day-old pizza sitting in the box on the counter. As soon as you roll out of bed, turn on your oven to 400 degrees Fahrenheit, so it can heat while you make coffee and wash the sleep out of your eyes. Lightly grease a cast iron skillet with some olive oil. Put a slice of pizza in the skillet. Crack an egg or two onto the pizza, nestling it into the toppings so it doesn't slide off (if it does, though, no big deal, that's why you greased the skillet). Put it in the oven, and cook until the white is just barely set, and the yolk still runny, about 7 minutes. The pizza will be hot. Sprinkle some salt on the egg, and chili flakes on the whole mess. You can slide the slice onto a plate, or just eat straight from the skillet. Photos by Burcu Avsar, prop styling by Linden Elstran, food styling by Hannah Kirshner. To see more visit www.burcuavsar.com. Ramen broth, as portrayed in Japanese movies like Tompopo or Ramen Girl, seems almost mystical, something that takes decades to master and a special spirit to really get right. But lately, I've felt emboldened to make my own. It will never be authentic, but it can still be good. If you don't live in a big coastal city or have a plane ticket to Japan, chances are the only ramen you know comes freeze-dried in a plastic package. 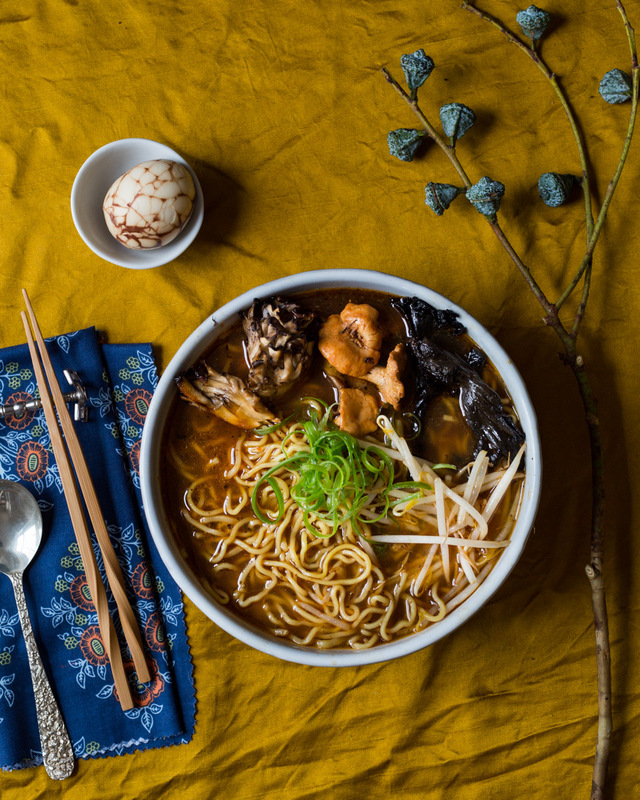 Instant soup is good in it's own way, but a great bowl of fresh ramen can be a transcendent experience. This is one of my more ambitious recipes, but worth the effort. Throw a ramen party to show off your work! (If you're looking for the easy way out, try these recipes on Refinery29 instead). Building your life around food (not for survival but pleasure) at times feels petty and frivolous. This past fall, my double life on twitter mirrored an internal conflict: as @sweetsnbitters I tweeted about Thanksgiving pie recipes all day long, while as @hannahrkirshner I obsessively followed news from Ferguson and cried about stories shared on #blacktwitter. What compels me to learn more and more about food is the opportunity to connect—to taste a culture, to explore a history, to express care and friendship—but it's easy to slip into treating food as just pop-entertainment. Is there a meaningful way to address social issues using cooking (and not just the ones that have to do with farming)? A dinner party that raises money for charity is nice, but the connection is superficial at best. I celebrated Thanksgiving joyfully even as concurrent events in Fergusson and around the country weighed on my heart; togetherness and pleasure are important, and we can't just live our lives being sad about the worlds' atrocities. But the challenge of making work with meaning feels pressing. Yuzu-kosho is my favorite Japanese condiment, in fact, one of my all time favorite condiments. In Japan, you might stir a little into porky ramen, or use it to flavor fish or fried chicken. I use it on anything I can, including sandwiches and bowls of plain rice. Get ready for this to become the next trendy condiment! A paste of yuzu citrus, green chiles and salt seems easy enough to make at home: the problem is, yuzu is extremely hard to find in the US, and even if you are lucky enough to come across one, it can cost four or five dollars for one little fruit! There is nothing quite like the perfume of yuzu, but Meyer lemon comes close. Its taste is not the same, but it is similarly aromatic and sweet-tangy. I use the juice in place of yuzu to make ponzu sauce, so why not use the zest to make yuzu-kosho? Guess what? Even with Meyer lemon as a substitute this is WAAAAYYY better that the little jars of the stuff you can buy in a Japanese grocery (and I thought those were amazing). The flavor is most intense when it's freshly made, and mellows as the days and weeks pass. Mine is at three weeks and still good—the salt is a strong preservative. This recipe takes about 10 minutes with a food processor (to make this by hand, grate the zest instead of peeling it, and finely mince the pepper, then mash it together it with a wooden spoon or mortar and pestle). The 4–inch long green mildly spicy chiles, often known as Korean Hot Peppers, are not hard to find in Asian markets and even some large supermarkets. Serrano or Jalapeño should make an adequate substitute, though a bit more spicy. The best thing about this recipe is: you can get a taste of yuzu kosho even if you live nowhere near a Japanese market (and you'll be able to say you were making yuzu-kosho before anyone else had even heard of it). 1. Use a vegetable peeler to peel the zest from lemons, getting as little of the white pith as possible. Reserve the fruit to juice for another purpose (such as this salad dressing). Put the lemon peel in a food processor. 2. Halve the peppers. Remove the stems, seeds and pith. Add them to the food processor with the lemon peel. 3. Add the salt, and process until the ingredients are evenly pulverized into a paste. Transfer to a small glass jar and store in the refrigerator. I moved to New York in the middle of a snowstorm four years ago, a few days after my birthday. Living here had been my plan since I was about five, and twenty-some years later, I arrived. My dad flew out to visit family in the East and help me drive the U-haul from Rhode Island to Brooklyn (I'd moved alone plenty of times, so this was special). I remember the snowflakes falling as we passed New Haven, getting heavier by the time we found my neighborhood, and snow up to our ankles when we brought the last box up the stairs. Here’s another snowstorm, blowing in just after my thirtieth. Brooklyn is home now, as the turnout of kind and interesting friends at my party (waffles and champagne in a new apartment) confirmed. And my dad was here again—a surprise visit arranged by my boyfriend! This time we sent him off just before the snow, on an early flight so he wouldn’t get stuck. 1. Preheat the oven to 325 degrees. Spray a bundt pan or a few mini pans with cooking spray. If you are using the mini pans, line them up on a baking sheet. 2. Rinse a small bowl with hot water to heat it up. In that bowl, pour 1 cup hot water over the chopped chocolate and cocoa powder, and whisk until smooth. Allow to cool slightly. In another small bowl, whisk together the flour and baking soda. 3. Cream together the butter, sugar and salt with an electric mixer on medium speed for about 10 minutes, until very pale and fluffy. Beat the eggs into the creamed butter, one at a time, scraping down the sides of the bowl between additions. Gradually beat in the chocolate mixture. 4. Combine the whiskey, coffee and vanilla in a large measuring cup. Alternately add the flour mixture and coffee mixture to the chocolate-butter mixture. Start and end with flour (I suggest three additions). 5. Pour the batter into the greased pans, nearly to the top. Bake for about 40-50 minutes in the mini pans or 80 minutes in a bundt pan (start checking for doneness 10 minutes before the time ends). Rotate the pans once halfway through for even baking. When a toothpick inserted in the middle comes out nearly clean, the cake is done. 6. Allow the cakes to cool for 15 minutes, then turn them out of the pans. Sprinkle the tops (formerly the bottoms) with a generous amount of whiskey. Then sprinkle with powdered sugar. The flavor of the cake improves by the next day. If you like, sprinkle more powdered sugar on top before serving. These will keep, covered, for a whole week at room temperature. Hannah's Hint: Most bakers (and Europeans) measure baking ingredients by weight instead of volume because it’s much more precise. I use volume, but measure in a particular way for consistency. Scooping flour can pack it into the cup, so you get too much and end up with a dry cake. The flour measurements in my recipes assume that you spoon the flour into a dry measure, then level it off with the back of a butter knife or handle of a spatula. That way it’s fluffy and not packed. I'm not on New Year cleanse or diet, but after all the cookies and cocktails of December, I crave simple food that won't burden my wallet or my waistline. A recipe for Savoy Cabbage and Parmesan Rind Soup caught my eye when I was flipping through a book of Italian vegetable cookery in my friend's living room the other day (in front of a fire, even). I have to confess, I didn't actually read the recipe, but the idea stuck in my head. Here's a soup with only two main ingredients that are nutritious and cheap as heck—what's not to love? There are always a couple of dried-out ends of Parmesan in my fridge, waiting to flavor broth. If you haven't tried this yet, you are in for a treat—and you'll no longer feel guilty when you don't finish that expensive Parmigiano Reggiano before it gets hard as a rock. Cabbage is truly an underrated vegetable, and even in the dead of winter it's in season. I don't think cabbage is about to be as trendy as kale, but it's got a lot more to offer than just a side of slaw. Braise it, saute it, stew it or ferment it. It's cheap, it's versatile, and lasts a lot longer than a head of lettuce in the crisper drawer (or even kale, for that matter). So lets make soup. You just need olive oil, garlic, Savoy cabbage (that's the round wrinkly one), salt, bay leaf, chili flakes (optional), and bread. Heat a little olive oil in a big heavy bottomed pot over medium heat. Crush and peel a few cloves of garlic, or more than a few, and toss them into the pot. Chop a whole head of Savoy cabbage into large bite-sized pieces. Add the cabbage to the pot and turn the heat to high. Saute until the cabbage and garlic are browned at the edges. Now fill the pot with water to cover the cabbage by a few inches, and add a spoonful of salt and a bay leaf if you have one. Simmer the soup until the cabbage is soft, longer if you have time, adding more water if it doesn't look brothy enough. Isn't it amazing how much flavor you can get from a few simple ingredients?! Serve the soup drizzled with more olive oil, and sprinkled with chili flakes and sea salt. A garlic crostini is the perfect accompainment (soaked in your bowl of soup until it's soft and crunchy at the same time). Here's how to make the crostini: turn on the oven to 400, slice stale bread and rub it with garlic, put a lot of olive oil on a cookie sheet and rub both sides of the bread in it (throw the garlic on the pan too), put it in the oven and toast until golden and crisp on both sides. This soup may be incredibly frugal, but it tastes rich. Poach an egg in the broth if you crave some protein, serve this as a first course before pasta, or simply enjoy it in its ordinary glory. Vermont Creamery provided ingredients for this recipe. Butternut, acorn, kabocha, pumpkin––squash season is upon us! It's easy enough to roast a couple of winter squash while you catch up on e-mail or watch tv. Just crank the oven to 450, slice the squash in half and scoop out the seeds, lightly oil it, and roast it on a cookie sheet until a fork can slide right in, or your finger can make a soft dent, about 30-60 minutes. Now you've got a side dish, the makings of pie filling, or the base for Creamy Squash and Tomato Soup. Once you've roasted the squash, you can make this soup using just one pot. Dice an onion and saute it in a tablespoon or two of butter until it becomes translucent. If you've got some wine––red or white, it doesn't matter––add a glassful and let it simmer for a few minutes (it's optional). Now add a big can or box of tomoatoes; I like the Pomi ones that come in a tetrapak. Use the can or box to measure out the same amount of roasted squash (just the flesh, no peel), and then twice that amount of water. If you have one of those stick blenders, blend the soup right in the pot. You want it thick and creamy, but not baby food smooth, so leave a little texture. If you don't have one of those, you'll have to get the blender or food processor dirty. Now add a big pinch of salt, and simmer the soup for a few minutes, at least, until the flavors blend. Stir in crème fraîche to make the soup creamy, thick and tangy––the amount should be to your taste, but I reccomend using a lot. Add a generous amount of cracked pepper. Taste a spoonful: does it need more salt? more crème fraîche? more pepper? Serve the hot soup with fresh herbs, if you can. This reheats well, and crème fraîche is much more stable than cream, so you don't have to worry about it curdling. If you're just cooking for one or two you can enjoy this soup for days. I shared some tips for being a great Thanksgiving guest in the November issue of Marie Claire. If you missed it, here's a recipe for the dessert I suggested bringing––with photos by my generous friend, Burcu Avsar. Thanksgiving isn't the time to try out some crazy new exotic recipe, but this playful take on a classic apple pie will please traditionalists and sophisticates alike. Dye the apples crimson and impart a subtle savory flavor by soaking them in festive Beaujolais Neauveau, which is released just in time for Thanksgiving! Making a galette is easier than pie: it's meant to look rustic so there's no fussing over the perfect decorative crust. You don't even need a pie plate, just an ordinary cookie sheet; and if you don't have a rolling pin, you can use the wine bottle! Once everyone tries this sweet-savory dessert, they'll beg you to make it a tradition. 1. Prepare a batch of pie dough for a single-crust pie according to any basic recipe. Wrap and refrigerate it. 2. Put the sliced apples in a large nonreactive container, pour the wine over them, and refrigerate for 24-48 hours. Stir them a few times during that period so they get evenly soaked in wine. 3. Drain the red wine from the apples; set apples aside. Add the thyme and lemon peel to the wine, and simmer it in a nonreactive pan until it reduces to 1/4 cup of syrup. Discard the peel and thyme; set the syrup aside. 4. Preheat the oven to 400 degrees. On a lightly floured surface, roll out the dough into a 12-inch circle. Put the dough on a cookie sheet, and stick it in the freezer for 10 minutes or until ready to use. 5. Arrange the apples on the rolled-out dough, leaving about 2 inches around the edge. Fold that about 2 inches over onto the apples, as shown. 6. Place the cookie sheet on a hot baking stone or directly on the bottom of the oven for the first 20 minutes of baking, then move to the center rack and bake about 30 minutes more, until the pastry is golden brown. 7. Drizzle the wine syrup over the apples. Serve warm or room temperature with crème fraîche or vanilla ice cream. We all need a few dishes we know we can cook from the pantry without a trip to the store, or for those times when you shop not knowing exactly when you'll actually get to use the ingredients (and a head of lettuce would surely end up slimy and forgotten in the so-called crisper). It's better yet if you can make it all in one pot, with as few steps as possible. This is one of those recipes. As I was eating a bowl of this pasta, it reminded me of something familiar that I couldn't put my finger on. Then it hit me: this is the fancy version of adding canned tuna and frozen peas to a box of mac and cheese! If that idea appeals to you, then stock up on these staples for a sophisticated yet comforting meal that can be pulled together with hardly any effort, and only one pan to wash. Even tea measurements are easy to remember! 1. Bring a large pot of salted water––as salty as the sea––to a boil. Cook the pasta to al dente. Drain off most of the water, leaving a Tablespoon or so of the water in the pot (you can tip the pan over the sink with the lid holding the pasta in, rather than using a colander). 2. Add the peas and crème fraîche to the pot, and stir to thaw the peas. Break the salmon into small pieces and add it. The crème fraîche should cling to the pasta: if the sauce is runny, return the pot to a boil for a few minutes to thicken it, then turn off the heat. Add lemon zest and the Parmesan cheese. 3. Serve topped with another dollop of crème fraîche, more Parmesan, freshly ground black pepper, and a sprinkle of fresh herbs if you happen to have them. Here's a recipe to prove that the lowly lentil can be fancy and sophisticated, and really delicious. You could serve this for a casual dinner party, with a simple salad and a bottle of wine––won't you seem chic!? But they are easy (and cheap) enough to cook for a night when you're feeding only yourself. If you're lucky, you'll have leftovers to eat for lunch: warm them and toss them with grainy mustard, more olive oil, a little vinegar and some peppery greens––they're reinvented! And the extra crème fraîche and chives you have left will be as beautiful on scrambled eggs or omelets as they are on this elegant bowl of lentils. 1. Cut the celery, carrot, and shallot into very fine dice, nearly as small as a lentil: this is your mirepoix. In a heavy saucepan over medium-high heat, sauté the mirepoix in 1 Tablespoon olive oil until the vegetables brown a little. Add the wine, and simmer until it reduces by half. 2. Add the lentils, a sprig of time, and 2 cups of water. Simmer until the lentils are tender but firm, and much of the water is gone. If the water disappears before the lentils are tender, add a bit more and keep simmering. Er on the side of undercooking when you turn off the stove. 3. Season the pot of cooked lentils with salt and freshly ground pepper, and the remaining 2 Tablespoons of olive. Cover the pot and let the seasoning settle in for at least 10 minutes. Serve warm lentils in shallow bowls with a generous dollop of crème fraîche and liberal sprinkling of chopped chives on each bowlful. I'm teaming up with my friend Terri Lee to moderate a panel at the New York Public Library as part of their Food+Art series. We've invited three creative thinkers and makers to join us in a conversation about careers that bridge disciplines. In our evolving fields we each use visual, literary, experiential, and gustatory mediums to tell stories and express ideas in different ways. It should be a fascinating conversation, and I hope you can join us! (For those who can't come in person, there will be an audio archive online). Hannah Kirshner, of Sweets & Bitters, publishes a series of themed mini-cookbooks that use recipes and images to create narratives. Her publication and blog encourage readers in the practical art of good living. She freelances as a recipe developer, writer, and food stylist. Terri Lee is a food designer: she helps brands create products and experiences related to food. She has designed exhibits, retail interiors and consumer products for REI, Williams Sonoma, Sengware and Chef’n, and interactive food experiences for Great Performances in New York City. Shannon Mustipher of A Good Room cocktail consultancy creates drinks and menus that evoke ideas beyond flavor. Her creative process involves sketching concepts, hinting at her background as a painter. Her illustrations appear in the Modern Travellers' Green Zine. Emilia Terragni is publisher of cookbooks at Phaidon. She was recruited from the museum world and her work with cookbooks started serendipitosly, but launched a whole new division at Phaidon that has changed expectations of what a cookbook can or should be. Ameilia Coulter of Sugarbuilt cookies illustrates expressive designs with royal icing on New Mexican sugar cookies. Research and storytelling, skills honed as a sculptor, inform the images and flavors she chooses. Emilie Baltz is no longer able to join us, but we'll discuss her work and that of other fine artists who use food as their medium. The humble pancake is as infinitely variable as it is easy to make. Mixing basic pancakes from scratch takes maybe a minute or two longer than ones from a packaged mix. This variation with apples, rye flour and crème fraîche asks only that you slice an apple and add one extra ingredient (and if rye flour is not on your shelf, that you shop the day before). Buttermilk might not be a pantry staple for you, but let me make the case. I don't really drink milk, I use it mostly for baking. Real buttermilk, because it's cultured, lasts longer, and it makes more tender and flavorful cakes, biscuits, and pancakes. It's not hard to use up a quart. It's tang compliments the rye flour in this recipe, as does crème fraîche. If you're not familiar with crème fraîche, it's thick cultured cream. It tastes rich, subtly complex, and slightly sour. The best use, as far as I'm concerned, is to serve it with fresh berries: dessert in an instant! But berries aren't in season now. In this batter, crème fraîche makes the pancakes rich and tender, and served on top it's like whipped cream for grown-ups. 1. Peel and core the apple, and cut it into very thin slices. Set aside. Heat a griddle to 375, or a skillet over medium-high heat. Heat the oven to 150-200 degrees, and set out an oven-safe plate or pan. 2. In a medium mixing bowl, whisk together the dry ingredients: rye flour, sugar, salt and baking soda. In a small mixing bowl, beat the egg. Whisk in the crème fraîche, then the buttermilk. Mix the wet ingredients into the dry ingredients. Stir only long enough to moisten the flour–lumps are ok and stirring too much will make rubbery pancakes! 3. Swipe the griddle or pan with butter to grease it. Dollop about 1/4 cup of dough onto it, spreading it out sou it's about 1/2 inch thick. Press a few apple slices into the top of the dough. Cook until the bottom edge look firm, and you see a few bubbles in the top of the pancake. Flip, and cook a few minutes more. Place the finished pancake on the oven-safe plate or pan, and keep warm it in the oven. Repeat until you've used up all the dough. 4. Serve warm pancakes with butter, maple syrup and crème fraîche. Crunchy, salty, a little spicy, and easy to make from ingredients you probably have or can grab from any corner store, this Spicy Caramel Corn is an indispensable recipe. I served it with cocktails in the second edition of the Sweets & Bitters mini-cookbook; for a party at menswear store Goose Barnacle we added peanuts and packaged it with Tattly tattoos for a sort of home made Cracker Jack; and I've filled tins of it to give away for Christmas. How about making it as a Halloween treat? You can add nuts, change or omit the spices, and package it in some adorable way to make it your own. Get the recipe from Edible Brooklyn! This week, Rosie Schapp wrote in the New York Times that Pastis (and all its anise-flavored analogues) are like soccer, "Something of indisputable greatness that is better appreciated elsewhere in the world than it is here." For me, it goes further: these are things I feel I should love, but I just don't totally get it. I only watch soccer during the World Cup, and I like just a hint of Pastis/Ouzo/Arak in a cocktail––I'm not yet drinking it with just ice water. But there's at least one anise-inflected drink I make in which Arak is balanced with citrus, mint, and a hint of black tea. In Volume 3 of Sweets & Bitters, Devra Ferst transports us to a Tel Aviv Beach with recipes for an Israeli brunch, and this is the cocktail from that story. the mint a few times (too much muddling produces an bitter or muddy flavor). Fill the shaker to the brim with ice, seal, and shake hard, until nearly too cold to touch. 2. Strain into a chilled cocktail glass. If you don’t want bits of mint in your drink, hold a fine mesh strainer over the glass to double strain. Garnish with one small mint leaf. Head to a liquor store in a neighborhood with a large Middle Eastern population to find arak. If you can’t get arak, ouzo or pastis are fine substitutes. Steep the tea leaves in the just-boiled water for 4 minutes, strain, and stir in the sugar. If the sugar is not dissolving, heat the syrup gently, stirring constantly, until it dissolves. Keep refrigerated. Hannah's Hint: Just for fun, try the drink before and after the addition of salt. It neutralizes the slight bitter aftertaste, and mellows the sweetness! 1. In a punch bowl, combine the whiskey and switchel. Add a large block of ice and stir to chill the punch. (Make an ice block by freezing water in a metal mixing bowl, budnt pan, or bread pan). 2. Add the seltzer to the punch and serve immediately, over ice; or ladle out 3/4 ounce servings of punch over ice, topping each portion with seltzer. 3. Finish each glass with a pinch of sea salt, and stir briefly before serving. Garnish with flowers, if desired. p.s. I made a flowers and bees for my hair too, in the spirit of this event! p.p.s. An extra big thanks to all my awesome helpers schlepping and serving the punch! Think of switchel as colonial-era gatorade. Field workers would sip the refreshing mixture of honey (or molasses or maple syrup), cider vinegar and ginger, especially during the hot hard work of making hay––hence the alternate name haymakers punch. (The heat of the ginger was meant to keep the body temperature even). Here's my prediction: switchel is the new kombucha. It's tart, refreshing and purportedly really healthy. It's also way easier to make! I recommend steeping it for 48 hours to mellow and blend the flavors, but you can enjoy it in as little as two. I like to dilute it with seltzer (and add a splash of whiskey if I really want to relax). Let me know how you like to drink it! Combine all ingredients in a glass jar. Steep at room temperature for 48 hours. Serve chilled and diluted with water or seltzer, or use in cocktails. Keeps at room temperature for a week or more, or refrigerated indefinitely. You can add sun tea to your list of truly American things that are awesome (I don't always take pride in my country's food traditions, but I'm learning to more). The German, Kazak and Japanese friends I made it for last week all commented on how quriky and foreign the method of steeping tea in the sunlight seems to them. To me, it's nostalgic––I inherited a big jar that my grandmother used just for that purpose. Right now, I'm making sun tea with sweet tree ripened peaches, for as long as the summer fruit and hot days last. The peaches give up most of their flavor to the tea, so I discard them (after eating a few slices in the kitchen anyway). Because of that, I just throw loose tea right into the pitcher and let everything get all mixed up, and then strain out the tea. If you want to serve the peaches, you could use a tea bag to keep things neet. 1. Combine everything in a glass jar or pitcher, cover, and set in the sun for about four hour. 2. Chill the tea in the refrigerator, then strain it into glasses (with or without Ice). This keep well in the refrigerator for a few days, peaches, tea leaves and all. You might think of waffles as a weekend-only breakfast ordeal, but when you make the batter the night before, weekday waffles are easier than frying eggs! I woke up on Wednesday morning to the buttery yeasty smell of overnight waffles. My boyfriend was in the kitchen perfecting his technique with our brand new Belgian waffle maker (we finally grew tired of the Hello Kitty one I bought when I was 20, with its tiny kitty-shaped waffles). The pull of sleep is strong––I'm not naturally morning person––but the pull of waffles is stronger, especially when their toasty aroma and the sound of a kettle clanking onto the stove draws you from your pillow to the kitchen table. Here's the recipe, so you too can wake up to waffles. If there's not already someone in the kitchen making them for you, it's ok, because all you have to do is scoop batter into the waffle iron and sip your coffee while they cook. You'll have prepared the batter the night before (and dreamed sweetly of waffles all night). If you're solo, or the family doesn't have a big appetite, leftover waffles can be frozen to be toasted at a later date. Or you could eat them for lunch with savory toppings like sharp cheese and sweet cherry tomatoes. Get out the measuring cups to night, and you'll be able to make waffles with your eyes closed tomorrow. Not only does thinking ahead make the morning cooking easier, rising the batter overnight develops a rich bready flavor unlike any other waffle you've had. 1. Make the batter the night before. Put 1/2 cup tepid water in a large mixing bowl (the batter will double in size), add the yeast and stir. Let stand for 5 minutes. 2. Add the warm milk, melted butter, salt, sugar, and flour (everything except the eggs and baking soda). Beat with a whisk until the batter is smooth. 3. In the morning, plug in your waffle iron and heat it up. Beat the eggs. Stir the eggs and baking soda into the batter. Cook the waffles according to the waffle iron manufacturer's instructions. Generally, when the steam subsides, the waffle is ready. Waffles can be kept warm in a 250 degree Fahrenheit oven for about 15 minutes. Extra waffles can be frozen. Did you know that all you have to do to make a classic deli-style dill pickle is put cucumbers in salt brine and wait a few days? I tried this for the first time last fall, and wondered why I hadn't been doing it forever! I LOVE pickles, and these were the best pickles ever, for very little work. Now I make them all the time. Here's how to do it. All you really need to know is this ratio: 2 Tablespoons kosher salt to 1 quart (4 cups) water. That's your brine. Get some kirby or pickling cucumbers––the small knobby ones that have a thin skin, dense flesh, and fewer seeds. Wash them well in a big bowl of cold water with a splash of white vinegar (the vinegar is optional, but will help kill unwanted bacteria). Trim off any bits of stem or flower. Rinse the cukes, then fill the bowl back up with cold water and leave them to soak. Clean a couple of glass jars well. It's not a bad idea to disinfect them with a little vinegar too, then rinse them thoroughly. All your tools, and your hands, should be very clean. The idea is to encourage good bacteria and avoid bad ones. Once fermentation starts, the acidity, along with the salt, will do that job. You can make pickles without any seasoning, but lots of garlic and dill will make them taste like classic Kosher dills. Mustard seed and dried chilies are nice too. Peel a bunch of garlic and pack a few cloves into each jar. If you can find the fresh flowers or seed heads of dill, that's ideal, but a few sprigs of fresh dill leaves or even a spoonful of dried dill will do fine. Tightly pack the cucumbers into the jars along with the seasonings. Leave some space at the top so they'll be completely submerged in brine. Make as much brine as you'll need by stirring salt into water (2 Tablespoons to one quart) until it dissolves. I like to make a little at a time until I fill all the jars (you'll probably need half as much as the volume of your jars). Pour brine over the cucumbers to cover them. I go right up to the top of the jar. Putting a grape leaf in each jar will keep the pickles crisp. You can also use a cherry leaf, blackberry leaf, or oak leaf––even a tea bag or some hoppy beer. If you go foraging, make sure you know what you are picking! The tannins from the leaves help preserve the cell structure of the cucumber––Harold McGee or Sandor Katz can probably better explain how that works. A note of caution: look for the rounded oak leaves rather than the pointy ones. If you can only find the pointy ones, use a very small one. They're really tannic and can make the pickles bitter. With cherry leaves on the other hand, you might want to use two. Place the leaf on top of the cucumbers to keep them submerged in the brine and protected from potential mold. You can loosely seal the jars: the good bacteria come from the cucumbers rather than the air. Gas will need to escape, so leave the lid loose, and open it once a day. It's not a bad idea to put a tray or dish towel under the jars in case a little brine spills over. Usually it's recommended that you ferment things in the dark, but the antibacterial properties of sunlight will keep mold from growing on the surface of the pickle brine (I've never had mold, but it is something to watch out for). I ferment my dill pickles on the windowsill, but they will likely do just as well in a closet––see what works for you. Check on the pickles daily. Lift the lid to let off gas. The pickles are ready when they lose their bright green color and smell sour. After three days, you'll have half sours, after a week or two, sour dill pickles. When they reach the taste you like, transfer the jar to the refrigerator. Eat the pickles within a few months, and then make more. If you have fun with this and want to try other fermentation projects, The Art of Fermentation, by Sandor Katz will tell you everything you need to know, including the history and science behind a lot of the recipes. It's one of my favorite books.